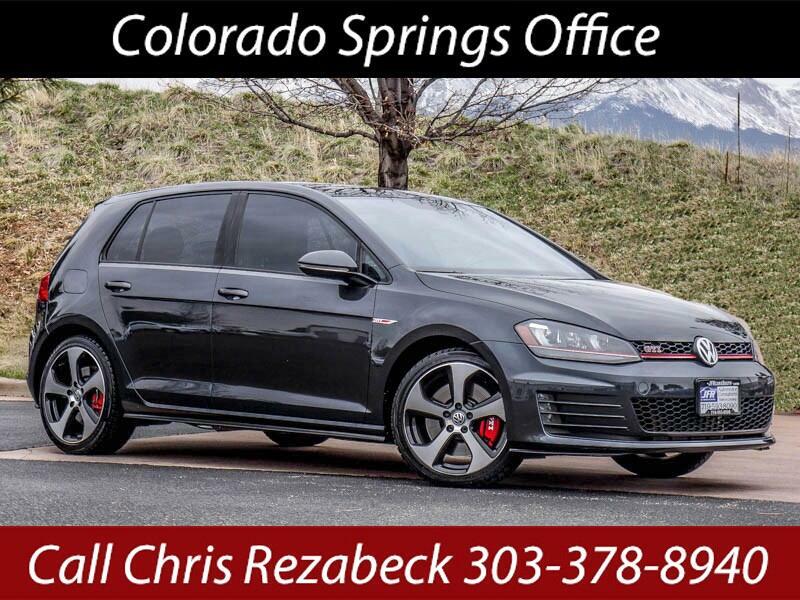 Used 2017 Volkswagen Golf GTI SE 6M 4-Door for Sale in Littleton CO 80120 JFR & Associates, Inc. This low mileage VW Golf GTI offers a sophisticated ride quality, sporty handling, lots of room and high-quality interior materials. Plus it's just plain fun to drive. The interior is user-friendly and laid out nicely. You'll find the controls are easy to use and at your fingertips. The seats are supportive and comfortable. You'll also appreciate the smooth ride quality, and it's easy to get in and out of this GTI. The turbo engine provides plenty of power when you need it most. Merging in traffic is a breeze, quick and easy. This Golf GTI comes with a variety of options like aux audio jacks, Bluetooth integration, CD player, keyless entry, heated seats, sunroof, tinted windows, tilt wheel, plus lots more to make your driving experience more enjoyable. You are cordially invited to take this VW Golf GTI for a test drive and find out for yourself how nice this car handles and drives. Contact us today and set up your test drive.